Hermann - Spielwaren GmbH, Coburg, Germany, "Reverie in Blue" Traditional Teddy Bear. HERMANN Jahresbar 2019 Reverie in Blue. 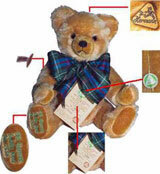 Mohair teddy bear with traditional excelsior filling. Growler voice. HERMANN Jahresbar 2019 Year Bear. Triangular HERMANN neckmark in the back of his head and the green HERMANN hangtag - The bear with the running dog.